This page brings a list of places where you can get parts. There are certainly other places. Let us know when you know of any. In Roger's newsletter from July 1985 (#12) there is another list of sources. He also explains briefly, where Bede got some of the parts from. Curved windshield This windshield was designed by Roger Mellema. It increases the cruise speed considerably and lowers the wind noise. Roger had sent the plans for the windshield two weeks before his fatal accident to Glen. Glen still produces them, they are of 3/16" Solar Gray tinted Plexiglas. The price (Oct 2002) is $388, shipping crate $75. Glen also offers the side windows for $125. Attn. Robby Grove Landing gear They have the original BD-4 gear leg design at hand and can deliver a custom made landing gear for the BD-4 out of AL 7075. Price = $800. As an option one can also have a hole drilled to replace the external brake line. Price of this option: $100. If you consider a Grove gear you may want to talk to Bryan Cass. He researched this topic and talked to Grove about making a one-piece gear. Plans for an outside baggage compartment door: $7.00. phone: (714) 547-7135 Fuselage angles They're an air conditioning fab shop. Craig Evans let his angles bent by there. He paid $550 plus $200 in tooling fee. He asked Tardiff to keep the dies for other BD-4 builders. This means they will now bend without charging for the tooling. Click here for a picture of a set of angles. e-mail: jelienau@aol.com Another BD-4 book: "How to Maintain"
Stephan Pelgar Flush fuel drains for the sumpless wing tanks of the BD-4. It is not easy to find flush fuel drains for the sump less wing tanks of the BD-4. Ken Strite built them in. Bending fuselage angles Lance Schlichter and I bent a number of angles in this shop. John Blaser is very friendly and helpful. He charges $35/hour for labor. 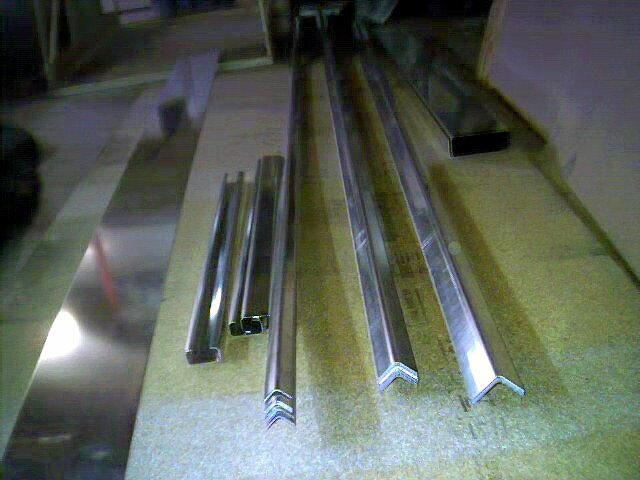 [Ed:] If you don't find any place to bend the angles I can get this bent for you at NW Sheet Metal which is not far from my home. Note however, shipping of parts longer than 6 ft is not cheap. UPS will not do it I heard. Also check out the pages about how to build a bending brake or a press brake (press brake, bending brake). Angles up to 4 ft I bend on the bending brake I built (i.e. the landing bear box). Good prices for ball bearings, rod ends and stuff. Have both new and reconditioned parts. Very complete stock. I would suggest polyimide foam or Melamine foam. Both of these products are Class A fire Rated. Polyimide foam passes Boeing specs and is used in commercial aircraft. Melamine is going under Boeing testing and meets many fire standards. Both have great sound absorption. If you need any specs or certs let me know. AAA World Metals Online Co. Gears, pulleys, actuator motors, etc. Roma Machine Tool & Die, Inc.